Janis Joplin: Rise Up Singing by Ann Angel. (Grades 8+) Amulet Books, October 2010. 120 pages. Reviewed from ARC snagged at BEA. With frizzy hair and bad skin, Janis Joplin didn't fit in with the polished girls in her Texas high school. While they wore circle pins and listened to Pat Boone, Janis preferred blues and longed to get out of her small Texas town. After high school and a few stints at college, she ended up in San Francisco and started her singing career - a career that would lead to packed venues, tours in Europe, and appearances on TV. In 1995, almost 25 years after her tragic death, she was inducted into the Rock and Roll Hall of Fame. With a straightforward, conversational tone and tons of pictures that bring the psychedelic '60s to life, Janis Joplin: Rise Up Singing will introduce teen readers to the tragically short life of this iconic singer. The book's layout, with pages edged with trippy designs, adds to the overall feel of the book. Obviously, this is going to appeal to teen fans of Joplin's music, but the story of an idealistic outsider finding a place for herself and succeeding beyond her wildest dreams will appeal to a wide audience. Biographer Ann Angel doesn't shy away from the more scandalous events in Joplin's life - her copious drug use and an abortion in Mexico - but she doesn't glorify them either. She includes a time line, source notes, a bibliography, and an index. 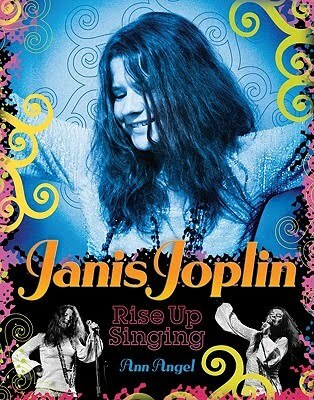 Janis Joplin: Rise Up Singing will be on shelves October 28, just after the 40th anniversary of Joplin's death. It's Nonfiction Monday and you can check out this week's roundup at Wrapped in Foil!